Shoden-ji 「正伝寺」is a small, quiet temple of the Rinzai school of Zen Buddhism in the northen part of Kyoto. 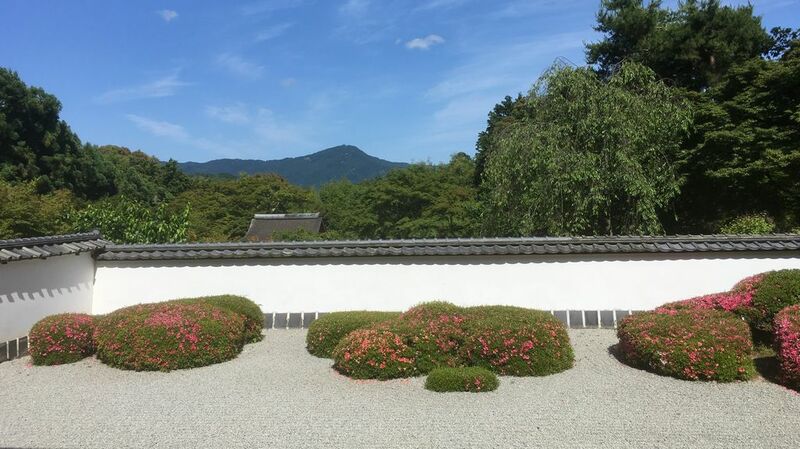 Its unique dry Zen garden in front of the main hall makes use of “borrowed scenary”, in which the distant Mt. 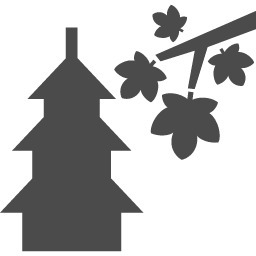 Hiei serves as one of the garden’s main elements, along with beautiful azalea bushes. The garden is said to have been laid out by the famous garden designer and tea master Kobori Enshu in the Edo period (1603-1868). The temple’s main hall, has been removed from Fushimi Castle in 1653. 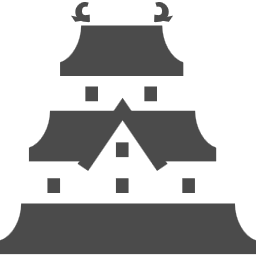 In the castle, many samurai commited suicide (hara-kiri) during the Sekigahara battle in 1600. The bloods-stained floorboards of the castle became the ceiling of the temple to pray for those who gave their lives in the battle. It is called “Chi-tenjo” literally bloody ceiling. It awakens only for the annual Gozan Okuribi Fire Festival, the Buddhist festival of the feast of our ancestors. Gigantic Kanji characters and other motifs are lit on the five different mountains of Kyoto. These fires are intended to see off the spirits as they return to the other world. Shoden-ji Temple is responsible for one such fire, on Nishigamo Funayama, a neighboring mountain. Hike up a hill a bit to the temple from this gate. Tributes to David Bowie have poured in at a place known more for its tranquility than the innovative sounds created by the music legend. “I came to this temple, cherishing the memory of Bowie,” one visitor wrote in the guestbook at Shodenji temple in Kyoto’s Rakuhoku Nishi-kamo district. Bowie had long been fascinated with Japan, especially Kyoto, and Japanese culture is believed to have had an influence on his artistic endeavors. For example, the makeup Bowie wore for “Ziggy Stardust,” his fictional rock hero in the early 1970s, resembles the makeup worn by Kabuki actors. But Shodenji temple may have had the biggest impact. When visitors pass through a gate of the temple, they can see a gently sloping stepped approach that stretches to the main hall. Scarlet-tinged fallen leaves wet with dew were stuck on the surface of the approach to the temple in late autumn. Trimmed azalea bushes created round green islands in a sea of sand, gravel and stones that make up a “kare-sansui” Zen garden. In 1980, Bowie created an instrumental piece titled “Crystal Japan” for a television commercial promoting “Jun,” a shochu produced by Takara Shuzo Co. He also appeared in the commercial. “Filming the commercial footage at Shodenji temple was Bowie’s strong desire,” said Yoshiro Hosomi, 80, former chairman of Takara Holdings Inc., parent company of Takara Shuzo. Wearing a white silk shirt, Bowie exuded his sensitive nature during the filming at the temple. “His revolutionary and philosophical image brought about an innovation to the image of shochu. So I’m just grateful to him,” Hosomi said. “Crystal Japan” is filled with crystal clear sorrows that seem to purify and cleanse the heart of the listener. The tune has a flavor of “gagaku” (court music of ancient Japan) but in Bowie’s style. The instrumental also follows the tune of songs on his masterpiece album “Heroes” in 1977. Bowie visited many other places in Kyoto, including the Tawaraya ryokan inn in Nakagyo Ward and the Furukawacho shopping street in Higashiyama Ward. During an interview around 1980, Bowie said he visited Japan at least once a year and intended to buy a house in Kyoto. Nearly a year after Bowie’s death on Jan. 10, 2016, at the age of 69, visitors are still writing messages about the musician in Shodenji temple’s guestbook near the “engawa” external corridor. Access : The easiest way to get there. Take the Kyoto city bus number 9 towards Nishigamo Shako-mae. Get off after 40 minutes at Jinkoin-mae. From there, walk westward for about 750 meter.